The Generalized Emulation of Microcircuits (GEM) technology was developed by the Defense Logistics Agency (DLA) to provide a continuing solution to the microelectronics diminishing manufacturing sources problem. The program was initiated by DLA in 1987 and deployed in 1997 as an on-demand type contract. The program is currently managed by the DLA Land and Maritime with SRI as prime contractor. Utilizing a set of gate arrays and single line processing technology, SRI's on-site flexible wafer foundry manufactures a continuing source of form, fit and function replacements for non-procurable microcircuits. 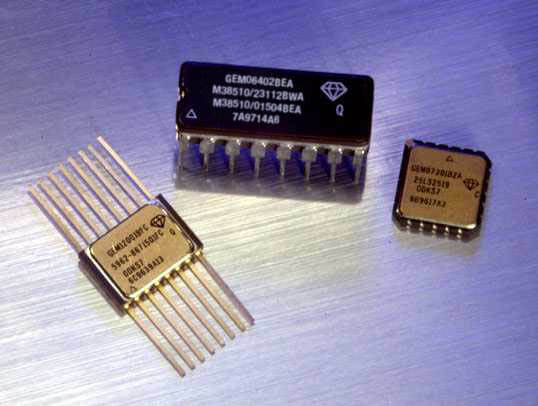 These GEM devices are supplied to existing system documentation (source control drawings, military slash sheets, standard military drawings and/or M38510 specifications) and meet the specifications of the original devices, including physical (package type, pin out), electrical (functional DC, dynamic, power) and environmental (ESD, temperature, hermeticity). GEM technology is used to produce microcircuits originally developed with RTL, DTL, TTL, Schottky, ECL, NMOS, and CMOS technologies including parts from bipolar and MOS microcircuit technology families, ranging from single function complexities to small microprocessors. Pin to pin propagation delay greater than 10 nsec mil temp or 5 nsec room temp. The GEM program provides a microcircuit capability that supports production, redesign, and sustainment requirements. GEM devices can be used interchangeably with original microcircuits without changes to system documentation or test programs. Once a device has been produced using GEM technology, a continuing source for the microcircuit is established from a government supported wafer foundry, allowing SRI to support requirements for the life of the system.